Falana free to go to court over 2017 budget —Senate – Royal Times of Nigeria. THE Senate has condemned Lagos lawyer, Mr Femi Falana, over the statement credited to him, in which he insisted that the National Assembly lacks the power to increase the budget. Senate spokesman, Senator Sabi Abdullahi, who spoke on behalf of the red chamber, said that Falana was seeking relevance, adding that he was free to take the Senate to court if he felt strongly about his views. 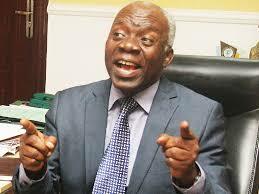 “He (Falana) is entitled to his opinion. We have been hearing so much from him these days. It’s like he wants to comment on everything. I liken him to those they call Charlie, Charlie lawyer. He is looking for attention. Let him take us to court if he so wishes. “In any case, 2019 is by the corner, let him contest and come to the National Assembly so as to show us the legal things. Let him come and consolidate and do the legal things, he can come to point out the illegal things to us,” he said. Falana had on Sunday, advised Acting President Yemi Osinbajo to withhold his assent to the 2017 budget forwarded to him by the National Assembly on Friday. According to Falana, the budget was “illegally” increased by the National Assembly. The legal luminary, who spoke in Ilorin, Kwara State, at a colloquium organised by the Movement for Genuine Change, to mark the 50th anniversary of the creation of Kwara State, stated that the National Assembly lacked the power to increase the budget. Falana also said that President Muhammadu Buhari could not sign the budget as of now, because he had written the National Assembly, intimating the lawmakers he was on medical vacation.